Scruton, Loyd: Birds seen at TNC trailhead in late afternoon: 6 Canada Geese, 1 Red-necked Grebe, 1 Horned Grebe, 2 Common Loons, 25 - 30 gulls. Scruton, Loyd: Birds seen at Cowlitz Dock at 5:45 pm: 2 Red-neck Grebe, 5 Mew Gull. Also, a harbor seal. Seen at TNC trailhead at 4:50 pm: 6 Canada Geese, 1 Red-neck Grebe, 13 small grebes (horned? ), 3 Common Loons, 30 gulls. Jill C. and Glen R. saw this bird at Disney. Glen says it is a Marbled Murrelet, a bird listed as "threatened" by U.S. Fish and Wildlife in 1992. Later in the month, Tony S. saw an Ancient Murrelet pair in Cowlitz. Glen R saw a Brown Pelican at Blue Moon Farm this morning. It dove from the air, and was very large compared to the other birds. Barry M said he saw one about ten years ago in Severson Cove. 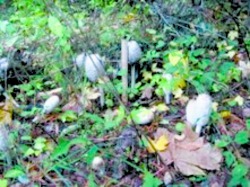 Isa D: These mushrooms were by the boys' outhouse at school. They are a foot tall.